Here’s a question I get quite a bit. It’s a question I had when I started out. I’m willing to bet that you’ve had this question, too, at one point or another. Sometimes getting started is the hardest part, when it comes to list building. I’ve boiled the process down to five steps you can take, beginning today. The first step is to choose your audience. It doesn’t help to build a mailing list of people who are interested in playing golf unless you’re selling golf-related products. If you’re in the internet marketing, make money online or business opportunity market you want to choose that audience. If you’re selling health products you want to choose an audience of people who are interested in health products. The second step is to have something to give. You need a premium, a gift. You need something to give them to entice them to join your mailing list. The information you give is valuable. That’s good. Sometimes you need a little extra something. If you notice, almost all sites that you visit that ask for your name and email address will offer you an instant gratification premium. This is something you can have right now. You need that. The third thing you need is something to say. If you had a list of 10,000 people right now, what would you say to them? You might say, “Please buy something from me.” That’s OK. You have to give and take. Would you ask them to buy? Would you ask their opinion? You need a way to capture leads. Sometimes that means a website of your own. Sometimes it doesn’t. This is the biggest sticking point for most people. “How do I get that form onto my website? I can’t even make a website.” We’ll cover that in a minute. You need to launch. You need to look at this like it’s a product launch. This is the beginning of something big and wonderful for you. It’s a mailing list of your own. That’s the most important thing you can do online. Let’s talk about choosing your audience. I want to give you keys for each of these points. First, what is your goal for the list? Do you want to directly sell them products? Do you want to ask their opinion about something? Do you want to offer them affiliate products or sell products of your own? Stephen Covey says to begin with the end in mind. This is very wise. Before you say, “Hey, join my mailing list” you need to know your goal for that list. Have something to give. Do you know people who are looking for a business opportunity? They’re looking to save time, save money or make money. What does your audience want? What do they need that they can’t find now. If you’re doing list building in a niche that you’re passionate about, you know what they can’t find now because you had a hard time finding it. Maybe that’s the right place to advertise. Maybe that’s someone to write your ads for. Maybe it’s someone to teach you about article marketing. Maybe it’s someone who will create your product for you. Maybe it’s someone who will just listen. What can’t they find now? If you can give them something that they can’t find now, you’ll be their hero. They’ll join your list in record numbers. You need to have something to say, a product to sell, a recommendation to make, a question that you want to ask, an offer of help. It’s important to know what you want to say to people on your mailing list before you begin your list building. The fourth thing you need is a site that captures leads. Sometimes this is the hardest part for people to get started. It’s called a squeeze page or lead capture page. You’ve heard those terms before. I’m teaching people to use an online service. Did you know that there are services online that will build a lead capture page for you today? These are $20 and $30 per month things where you can go in and create squeeze pages that look great and capture the information. If you can use a browser, you can have your own lead capture page. That’s what I recommend. Now, get ready to launch. Where to you get your first subscriber? Where does subscriber number one come from? Start with your address book. Once you have your squeeze page in place, your list ready and messages ready to go out, send the people in your address book a little note. Say, “Hey, I wanted to let you know that I have a free gift for you. I also have information that I think you will find valuable if you’re interested in this.” Send it out to the people in your address book. You might be surprised at what you get. You can use article marketing. If you’re doing article marketing now, change the resource box in your articles from where they point now to your squeeze page. It’s much better than sending people directly to an affiliate offer. This way you’re building your list. You can post on forums. You can go to the Warrior Forum, Tony Blake’s or Michael Green’s. Give helpful answers. There is social media. The people who are involved in social media love free stuff. Now you’re in a position to give them free stuff. Tweet about it. Write about it on Facebook. Set up your own blog. It’s easy to do and a great way to capture this information. Point them to your squeeze page. Give them the gift. They can download it immediately. Then they’re on your list. How about you? Do you need help with these types of things? If you do, I’d love to help you. Here are two sites you can go to where I’ll help you directly. There is DirectoryofEzines.com. We’ve been online since 199. We work hard to help our members. Then there is FollowUpSellingSystems.com. This is a new course I’m designing right now to help people use email follow- up. I appreciate your time and hope this helps you jump-start your own list building efforts. I look forward to being in touch with you again soon. majority 98% would find their opinions “offensive”. I certainly can’t believe it was “off-topic”. you’d be un-biased enough to be an effective teacher for me, to invest in your programs. Good grief man, you posted that comment 14 hours ago! I simply had not had time to read it, and reply. Which I did by the way. I’m sorry Paul but that’s just not accurate, or a right thing to say. If you choose to buy my products or not is 100% up to you. What is clear is that you don’t know me very well or you would never had made such a comment. We’ve all been there. No worries! “give away something for free, to intice them to join your list”. So, I did just that. in exchange for their name and email address. finish the double-optin process, and join the list as a bona-fide member. I filled my Aweber AR with quality email messages, and catchy titles. finished the double-optin process, ONLY clicked on the link which gave them a free e-book. The rest of the well-written emails which they received over several weeks, were NOT opened. that led to more education, and the subject of the email itself, were basically NEVER opened. looky-loo”, I’m too lazy to.. tire-kicker crowd, and my Aweber stats beared it out. No, I am not a fan of “give them something for free” up front. more about what I have to offer, or they don’t. to offer, and who will eagerly buy from my product suggestions. Interesting comments Paul. I understand your experience is not one you want to repeat, and I can understand that. But I’m not sure you can evaluate an entire marketing method, and a proven one at that, based on one experience. If I were analyzing what you said I would suspect that the traffic source, the person from whom you bought the solo ad, build his or her list by giving away freebies. This is not uncommon. Asking people from whom you buy solo ads how they built their list, and seeing that process for yourself, is one very important key in the solo ad world, in my view. Thanks, Charlie…..as always, great advice! Hey Charlie, I like reading your content I just wish I could put it all together and make a full time income from email marketing..If I found something to give away then I would have to figure out how to get it to a potential customer..
Finding something to give away is easy. You can have something written, use Private Label Rights products, interview someone — lots of options there. The key is to get your site going and online. You can’t steer a parked car, but push that car even 3 miles and hour and you can steer easily. Just like you can’t steer a parked car, you can’t get leads from a site that is not yet online. I do too! How is your back site doing for you? It looks very good. Wonder if it is performing. Hi Charlie, I really enjoy reading your blog. You always provide helpful information. One question I have is where do I find those free stuffs to give to those people who have opted in my landing page? Can we get those free stuffs or we have to buy online? Thanks. There are many products online with “giveaway rights”. You can search for such products or ask on forums in your niche and you should be able to find them. Just make 100% sure you have the right to give whatever you use away and you should be good to go. Really great information. It’s been difficult for me to just get started but your articles provide such sound and simple tips I get encouraged and my internal starter receives a much needed boost. Thank you. I’m happy my articles are helping. Thank you for your kind comments. Thanks Charlie for the great advice. I recently place my ad in of your advertisers ezines and in the first 10 days have amassed 300 subscribers. Traffic has doubled to my website and all because of focusing on the list. Now to increase the value of my newletters and make sure offers so I can convert some. Your information and advice is exceptional. Thanks Glenn! Happy to hear the positive feedback and happy too you are moving forward so well. This is a great post however I it doesn’t answer my question as I understand it. I am an author and want to contact people in this niche. How do I find people in this niche? To buy a list you get everyone? Thank you for your time. Buying a list to get everyone can’t be done. The Internet is much too large and such lists are not really for sale. Be very careful about buying “lists” as in most cases you end up spamming by accident. To contact people in your niche you either need to find people who already have lists and work with them so they can send your message. This is the essence of ezine advertising. Another route is to search for top sites and contact them using the information on their sites. Also, you can advertise using methods like pay per click or on Facebook and reach highly targeted groups. Since I don’t know exactly what you want to accomplish I can’t be more specific here. I enjoyed the information alot. I too am building my list for the first time. buying solo ads has helped create list fast. I do some twitter tweets but nothing has come from it. I’ll keep trying. Thanks Charlie. I have posted this article on Facebook. Very informative and easily understood. I look forward to reading a lot more. Thank you Charlie for awesome post and tips! If you start from zero and don’t have much money, I recommend joining giveaways as a contributor, and when you have a small list, you can start ad swapping and continue as a giveaway contributor too. Hope you are well. Charlie I have a list of about 700 and I only get about .5 to 1.3 % opening, and funny enough these are for “something for free” . I don’t understand why people are on a list presumably for information on how to make money online and don’t access this great info. I bet youv’e got an answer! I’m not sure if I have an answer but I do have an observation. Many marketers train their list to only want freebies by giving away too much free too soon. I’m writing an article on this in fact for my Email Marketing Quick Course so be sure to check that out. I hope you will find it helpful. Tank you Charlie to send List Building for Newbie’s it is wary veil exsplained each Srategy I love it! This will help me out a lot. I always get stuck on this and can’t really focus. Thank you so much Charlie. Thank you. You might like an article I have about focus. You can read it by clicking here. Hi Charlie. Thanks for the good oil. You always come up the the info. Another top-notch article! Thank you! Instead to explain why your article is useful and good and helpful I am just saying CHARLEY YOU ARE GREAT! I shared this on my Facebook profile! very much for all the help that you have given me through your emails. My website is getting me some good leads. Again thank you! Great post Charlie. Thank you for this valuable information on list building. Hi Charlie, Thanks for the informative article. What you have described here, is EXACTLY what I’m doing to build my list. I had a Squeeze Page built for me for around $400.00 for a special project of mine, but it’s just too expencive to build them in bulk at that price. Thanks for recomending Marketing Makeover Generator, I will check them out in the next day or two. Now to change the subject a bit, I have a question for you:) When will the NEW D.O.E be ready? Can you give an aprox date? I can’t give you a hard date but can say that I’m working on it almost exclusively now that I’m back and we are very very close. Thanks for responding to my question Charlie. As always Thank you for the Great information you provide. Ive been along time follower, and these days Ive shortened my list and shiney object syndrome wayyyy down, but your at the top, I will be signing up for the DOE here shortly, i know the value it can provie, right now Ive got my note book and have begun outlining my steps for success this year, and yes that includes the DOE its only taken my ten years and a whole lot of money to get this figured out,but i look at it as an education and the experience has taught how to pick and choose what I feel are the right people and right information to run with. btw, my first step is setting up my blog. anyway thanks again for all you do. Short, helpful, sincere: typical! Thanks again for your ongoing example of “how to do it” for many. Have a great weekend and all the best to you as you continue to advance in your updating, etc! 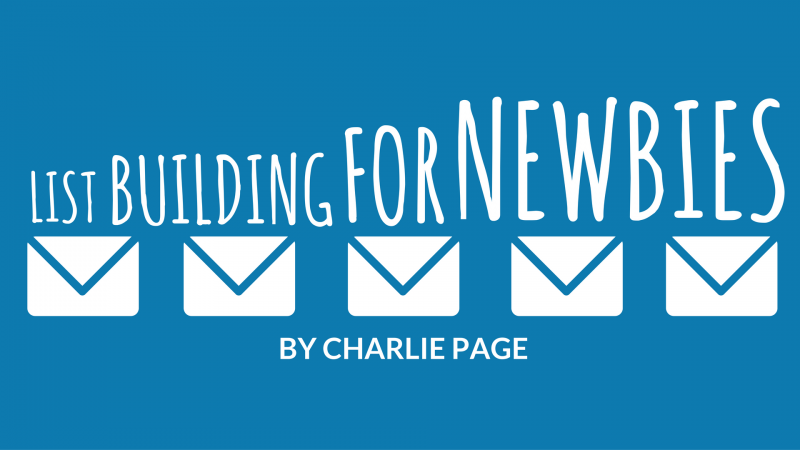 I’ve only recently started building my mailing list and you’re quite right Charlie, knowing where to start is a bit daunting. Your advice above about having something to give, and what do you tell them once you’ve got some sign-ups, is I think central to establishing any list and then keeping them on your side..
Glad you liked it. Business often really is more about what you give than what you get. Zig Ziglar was right – “you can get everything you want by helping others get what they want”. Hope I quoted that right! I like the way you simplify things…it’s so easy to get overwhelmed, you know info overload. You help me see clearly things I can do to get ahead in this game! I was referred to your DOE by another internet marketer. Your advice is calm, and simple something that is needed especially with all the hype. PS: I will be joining up for your membership site, plus I’ll be following annything else you got to say because your the “MAN”. Well another great video and good ideas, on getting started on building your list. This has been a hard subject for me, just getting started. Thanks very much for your info. I love your blog, thanks for all the great content. More sound, yet simple and concise ideas to help us focus on the things we need to concentrate of doing.